eMahad is offering an 8-year Online Traditional Islamic Learning Program based on the curriculum of Wifaq ul Madaris al-Arabiya, Pakistan covering an in-depth study of Quran, hadith, fiqh, usul al fiqh and Arabic language and grammar. The program will be taught by the experienced and skilled faculty of Mahad al-Faqir al-Islami, Jhang, the parent institution of eMahad, founded by Shaykh Zulfiqar Ahmad Naqshabandi (db). The institute currently has more than 900 students with more than 70 full-time or part-time faculty members. I can only understand basic Urdu, can I enroll in this course? Yes. The course will be run in Urdu. The lectures will be delivered in Urdu and the texts used are in Urdu and Arabic. Efforts will be made to stick to simpler Urdu so that more people can benefit. In the first years the focus will be on developing a strong background in Arabic. We will try to arrange soft-copies/scanned versions of all books that will be taught during the program. Those of you, who are based in countries where books are available would be encouraged to purchase their own book set. 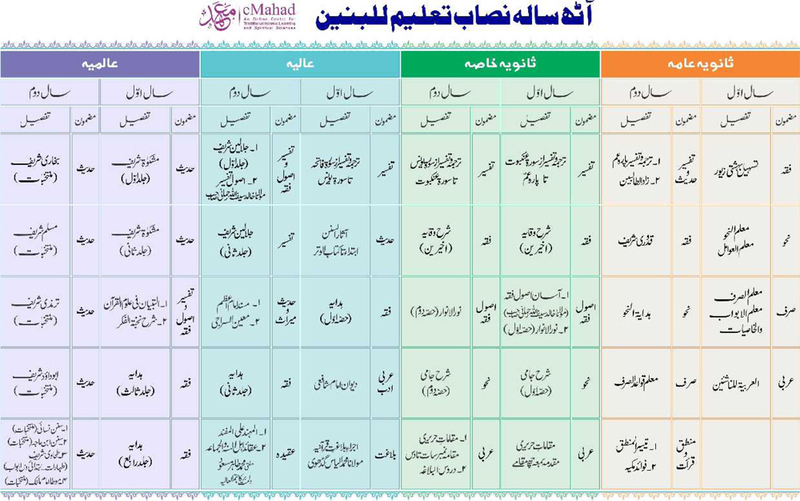 We will be following the standard 8 year curriculum proposed by WifaqulMadaris al Arabiya Pakistan. The curriculum has room for some flexibility which will be utilized. Answer: Internal examinations by eMahad will be conducted during the year and also a final examination will be conducted online. Those of you who can visit our parent institution Mahad al Faqir al Islami in Jhang, Pakistan or any of our affiliate institutes in different parts of the world would be encouraged to sit in on site examinations conducted by eMahad. By the end of the course, Mahad al-Faqir al-Islami, Jhang will issue you an Alim degree. Yes, there will be 2-3 hours of takraar/practice sessions per week.